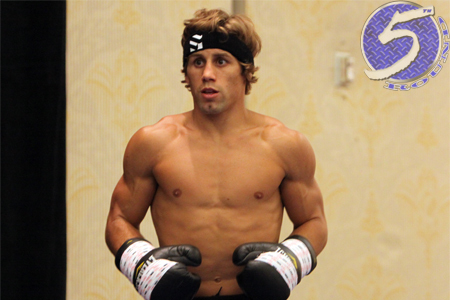 What are the chances Urijah Faber (pictured) fights on December 14? They’re a lot higher now that the UFC confirmed they’ll be taking their talents to Sacramento, California for UFC on FOX 9. The announcement was made during Wednesday’s UFC Fight Night 28 pre-fight show on FOX Sports 1. Although the UFC didn’t confirm in today’s report, the event will likely take place inside Sleep Train Arena (formerly known as Arco Arena). No fights were confirmed for the lineup. The UFC hasn’t been to Sacto since hosting “UFC 73: Stacked” in June 2007. However, the WEC, the UFC’s little blue-caged brother at that time, held “WEC 48: Aldo vs. Faber” in Cali’s capital in April 2010. Expect for Faber and several of his Sacramento-based Team Alpha Male teammates to be included in the roster.